The first week in April brought strong winds that delayed our departure from Moreton bay until Saturday 6th April when we were able to sail to Mooloolaba, I love that name. We spent the weekend anchored in the harbour. Monday morning we contacted the marina and got a berth for 2 nights. It was great to use the showers, washing machines, etc. The marina was also close to a huge shopping mall so we were able to restock the boat. Lawries boat services was next door to the marina and after talking to Kieran the manager, we arranged for Camomile to be lifted at 3pm and held in the slings overnight on the Tuesday. While Bill jet washed the hull I scrapped the little barnacles off. Bill scraped and greased the prop and also managed to get a coat of antifoul on the keel. The hull still has the Cuprotec coating, which seems to be holding up although Bill has had to repair it in places. We don’t have any photos because we had to work quickly before it got dark plus it rained most of the time we were out. Kieran arrived at 7.30 in the morning to put us back in the water for our second night in the marina. More rain. Thursday 11th we went back to anchor out in the harbour to find our friends Dave and Jacqui on Jackster had arrived. It was great to catch up. They were interested in hearing about the storm as Jacqui had been a tower of strength texting me throughout our ‘ordeal’. 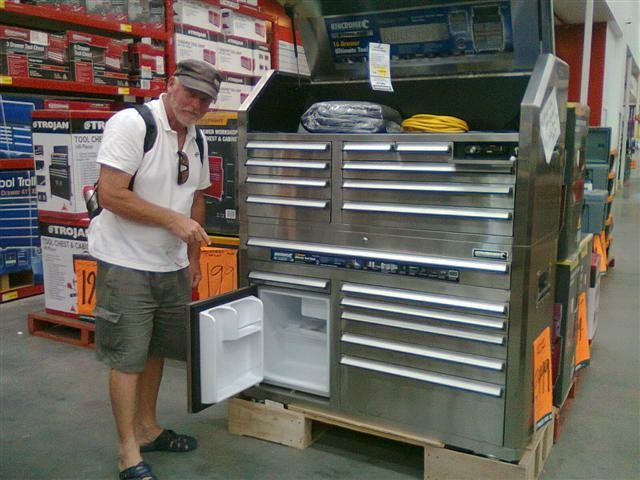 With more rain falling we took the bus to Maroochydore, another lovely name, for a mooch around the shops and Bill found another big toolbox, this one had a beer fridge!! There were strong winds blowing all week but on Sunday evening it was forecast to drop so, after a fantastic walk along the beach in the afternoon, we motored out of the harbour at 9pm with Raven I and Far Star for an overnight sail to Fraser Island. It was an uneventful passage, we managed a couple of hours sailing before the wind died completely. It’s been such a problem travelling up this coast, there’s too much wind for 6 or 7 days then it drops completely for a day or two before building up again. We have to watch the forecast constantly and as soon as there’s a weather window drop everything and go. 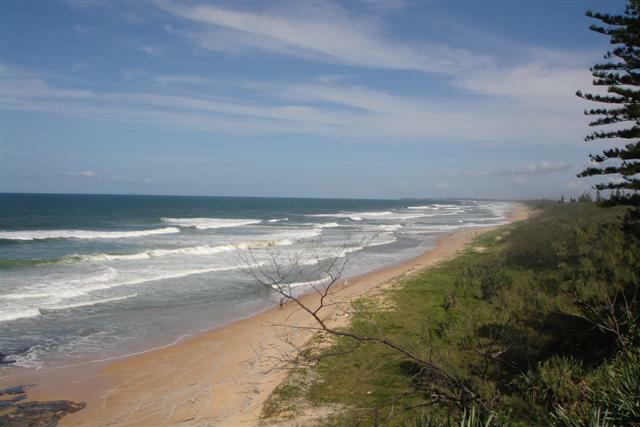 The entrance to the Sandy straights leading to Fraser island has a notorious bar across it called the wide bay bar. To avoid it would mean a 24hr passage at least around Fraser island so we called the VMR to check the condition at 9am. They were reporting rough conditions but no breaking waves so, after taking the entry waypoints from them, decided to cross it. The bar itself was fine, although we had 3 metre waves around us; the worse bit was travelling along the inside of it. As it’s name suggests it’s a wide bar and it’s very important not to cut the corner off and we followed the waypoints the VMR had given us but there were hugh waves breaking across the shallow part of the bar making the passage feel like we were in a washing machine. It took half an hour to reach the calmer water inside when I was able to radio back to Far Star and Raven to let them know what it was like. As they are both single handers they were brave to come over but we all survived and proceeded to motor up the Sandy Straits to Garys Anchorage. There wasn’t a breath of wind there but unfortunately it enabled the dreaded sand flies to fly out to the boat and Bill and I were badly bitten overnight. 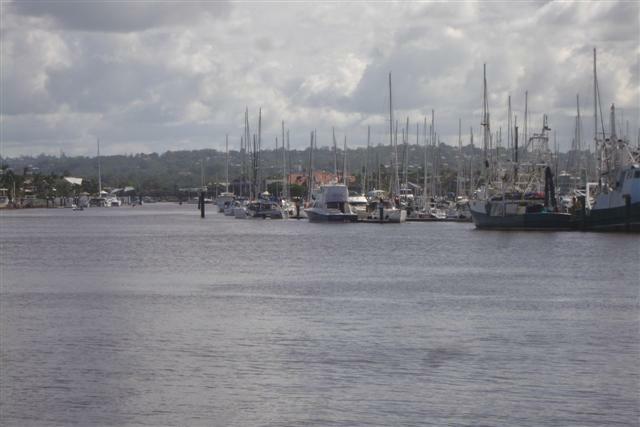 The next day, Tuesday 16th, we motored up the Sandy Straights to Kingfisher resort, a favourite of ours with its yachtie friendly facilities of a pool, shower and nice café that sells delicious lunches. 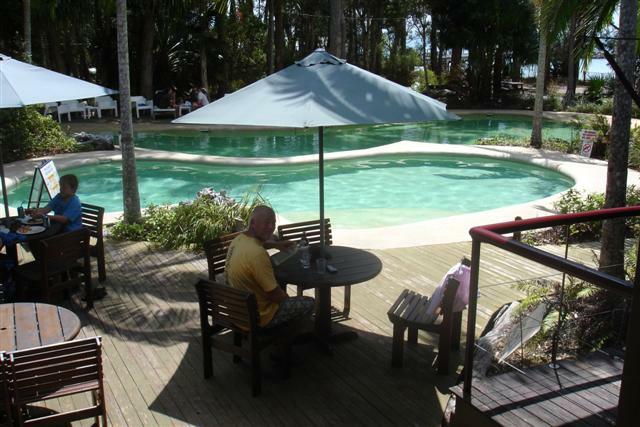 We stayed there for 3 days waiting for the start of the wind to take us north to our first island in the Barrier reef. Posted on April 19, 2013, in Circumnavigation, Coastal cruising, Port posts, Sailing, Westerly, Westerly Sealord and tagged Kingfisher resort, Lauries boat services. Bookmark the permalink. Leave a comment.